Kinver Brewery are pleased to be associated with the artist Karen Perrins who has been commissioned for the splendid artwork for the collectable Kinver Brewery beer pump clips. Karen has over sixteen years experience of illustration commissions in the UK and USA. Her clients include Ragged Bears, Oxford University Press, Macmillan, Quarto Children's Books, Lindt and Sprungli, TES, Harcourt International (USA), Cambium Learning (USA), The Book Guild, Parragon, Folens, Minerva, A & C Black, Reed Books, Splimple, Bender Richardson White, Imperial Cancer Research Fund, A Child's World (USA), Scholastic and of course Kinver Brewery. Karen works in watercolour, pastels, oil pastels and printmaking techniques. Her work can be found in children's books, commissioned greetings cards, book jackets, packaging design, editorial work and Kinver Brewery beer clips. A beer engine is name of the beer dispenser device for manually pumping beer from a cask in the pub's cellar to the bar. It was invented by John Lofting, a Dutch inventor, merchant, and manufacturer who moved from Amsterdam to London around 1688. He became an English citizen and patented a number of inventions including a device for pumping beer. The London Gazette of 17 March 1691 stated "the patentee hath also projected a very useful engine for starting of beers and other liquors which will deliver from 20 to 30 barrels an hour which are completely fixed with brass joints and screws at reasonable rates." The locksmith and hydraulic engineer Joseph Bramah developed the beer pump handle in 1797, co-incidentally the same year as the Stourbridge wine and Kinver Beer merchant, Nickolls and Perks were founded. Bramah also invented the Bramah Water Closet in 1778, an important predecessor of the pub loo. The beer engine pulls the beer through a flexible pipe from the cask to the spout, below which the glass is placed. A nozzle on the spout controls the amount of head on the beer. When Bramah invented the beer engine, the cellar was typically below the bar, but today there can be a considerable distance from the cellar to the beer engine and many publicans use gas pressure to assist the movement of the beer from the cellar to the bar to prevent the beer being sucked back up the pipe from the glass. A skilled barman will hold the glass at an angle to the pump whilst filling the glass, gradually moving the glass upright as it fills. The glass should not be filled, and the beer should be allowed to settle for a brief period before topping up to ensure that a full pint of Kinver beer is served. The clip is attached to the handle by a spring clip giving the brand name of the Kinver Beer as well as the alcoholic strength of the beer being served through that handpump. A much more stylish and practical bar pump than the large, tasteless fonts that decorate a simple on or off valve for CO2 dispensed keg beer. 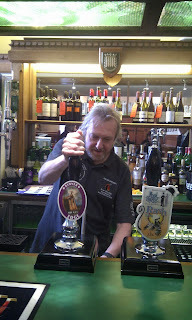 The handle of a handpump is often used as a symbol of cask ale. The ﻿Admirals of the Ultra good ship 'Kinver Brewery' have set a Target, hoping to continue the Tradition of brewing champion beers and earn more Brewers Gold and Bullion CAMRA or SIBA awards for their truly Citra (Sanskrit term meaning “wonderful") beers. 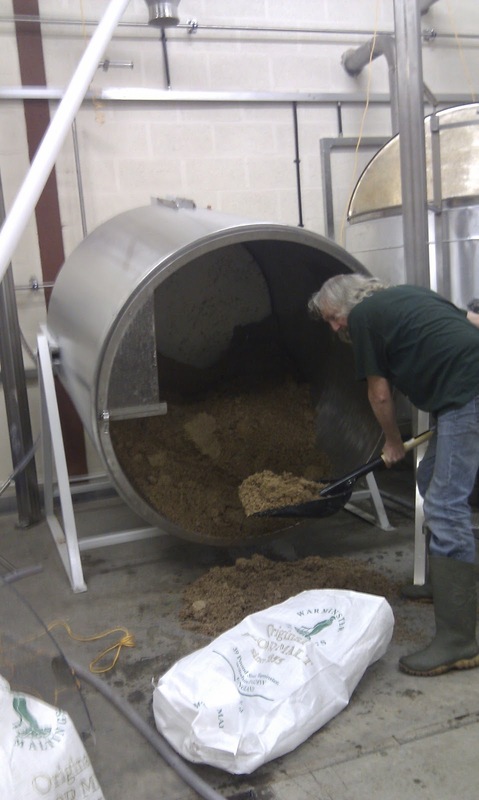 A decisive Challenge was taken to move the brewery to new premises in the Summer of 2012. The new brewery is just a short Northdown hop over the Horizon from the smaller Pioneer brewery premises at the former Kinver Crystal glassworks site, which was close to the centre of Kinver village which can trace its origins back to Saxon times. A Chinook helicopter might have been helpful to move the equipment and materials. The new brewery at Britch Farm, Compton, is the Phoenix the Brewery, the Liberty of a dream to be at the Vanguard of brewing award winning ales. Kinver was once described as the Switzerland of The Midlands, but there is certainly no Mount Hood or Mount Rainer near Kinver. The Pilot beers from the novel tilting mash tun, and new copper produced beers of such Sterling quality that "Over the Edge" soon achieved First Gold in the Strong Bitter category in 2012. A new fermenter was subsequently installed to increase capacity in 2013, permitting bottled beers to be introduced to Herald the Progress made since moving to the more Northern Brewery location, whilst ensuring Glacier temperatures were not achieved in the winter months. 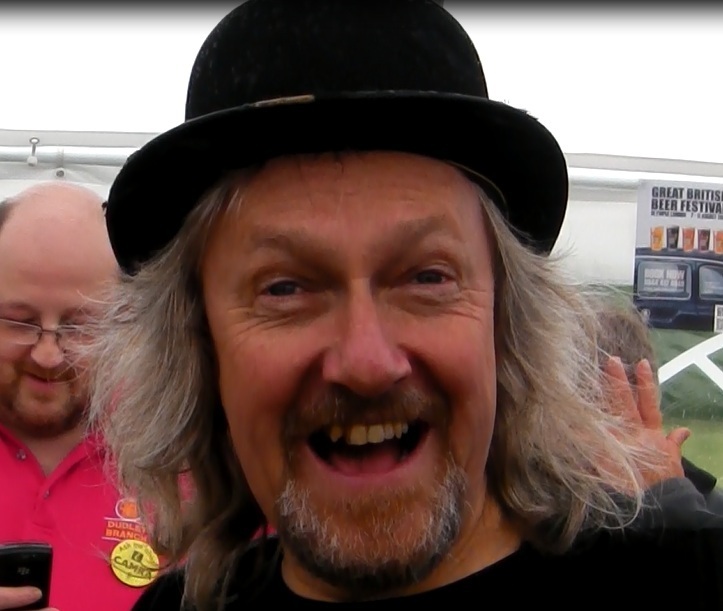 The brewery reached it's Zenith in 2014 achieving the Summit for the best Strong Ale and Barley Wine in the UK at the CAMRA Great British Beer Festival (GBBF). The Millennium brew was produced in 2015, and the busy brewers who had worked at the speed of a Comet to make a thousand brews, could take a well earned rest and Wai-te for the wort to Cascade from the hot liquor tank into the larger 12 barrel capacity mash tun. Perhaps having a Bramling apple, a slice of Huell Melon or even a tasty chicken Nugget and a cup of Columbia coffee for lunch before sampling the quality of their latest brew. Of course, without getting too Fuggled to find their way to Amarillo in the hop store, to Select the Super Alpha index of the Boadicea, Goldings, Newport, Simcoe, Azacca, Ahtanum or other international hop varieties that might be chosen for their next brew. A Cluster of bottled Zythos (Egyptian name for beer) is available for Pilgrims who visit Kinver from the village off-licence, Kinver Vino at 113 High Street, Kinver, Staffordshire, DY7 6HL. Whilst the beer is not available by the Magnum, 500ml bottles are hopping off the shelves and Kinver Brewery Endeavour to meet demand. Follow the Mozaic block pavement from one of the many free public car parks in the village to Vino. Draught Kinver on a hand pump is a regular at The Vine, and often a guest ale at the Southern Cross Inn, be sure to look for the distinctive font clips. The brewery take Super-Pride in the quality and taste of their king El Dorado beers, and "Over the Edge" is again the Sovereign of strong ale in the West Midlands in 2018, having Beatan off strong competition to Triumph. Whilst future accolades might be in the hands of the gods Apollo or Zeus, the future of Kinver Brewery will continue to shine like a Saphir or the pole star Polaris in the hands of Dave and Ian. Hop aboard and enjoy a pint of the Perle beer of the West Midlands! Bravo! Or Prost as the brewery Warrier KinverDave Saaz!